Nanjangud is a small town located on the banks of Kapila river just 23 kms from Mysore. This place is also known by the name "Dakshina Kashi". Between 11th and 12th century this ancient city was under the control of Chola Dynasty. 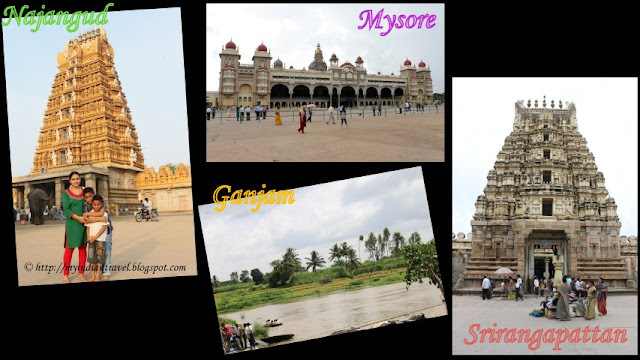 There after it was under the control of Hoydsalas, Wodeyars etc., The place is famous for Srikanteshwara Temple. This city is also famous for a variety of banana grown in the region. There is also lake in the town where you can spot birds. Birds and temples ... lovely! Enjoyed seeing your family. Hi happy Mosaic Monday! What a wonderfull palace! What a wonderfully ornate temple. Those pale blue skies make the perfect backdrop for your capture, Rajesh!! I hope you have a great new week!! Hello, the temple is beautiful and I love the birds! Great post. Have a happy week! Oh my that is a stunning temple....what a unique shape and carvings. Another fantastic temple, and the bird photo is lovely as are your photos of the temple and scenery. Most elegant and impressive architecture ~ Lovely presentation of your wonderful photos! What a beautiful temple, shining in the sun. Another magnificent temple. All that intricate carving. It is mind boggling. Lovely picture. I'm always impressed with the craft involved in the locales you highlight. Wonderful pictures of a very special area in India. Your country is so enchanting. Hello! :) Beautiful temple and bird images. Thank you for your beautiful and interesting post. Now, there's a temple that will take one's breath away in person. And, to have egrets nearby, too. Beautiful spot. Another beautiful illustration of India! Amazing buildings, they're very interesting. Enjoyed going through your post! Lovely captures of the temple and the lake with adorable birds. I wish to visit this holy and serene place with my kids and family soon. Thanks for sharing this beautiful post that describes about the temple so nicely!